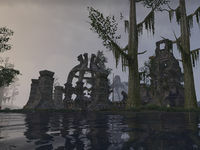 Addadshashanammu is an unmarked Daedric ruin found in the Bitter Coast region of Vvardenfell, northwest of Balmora. It is not marked on the map, but is one of the locations you need to visit for the Daedric Explorer achievement. Daedric Explorer 10 Visit all of the Daedric ruins in Vvardenfell.